Halloween is one of my favorite holidays because I love dressing up and I love skulls, as you can tell by my blog name. 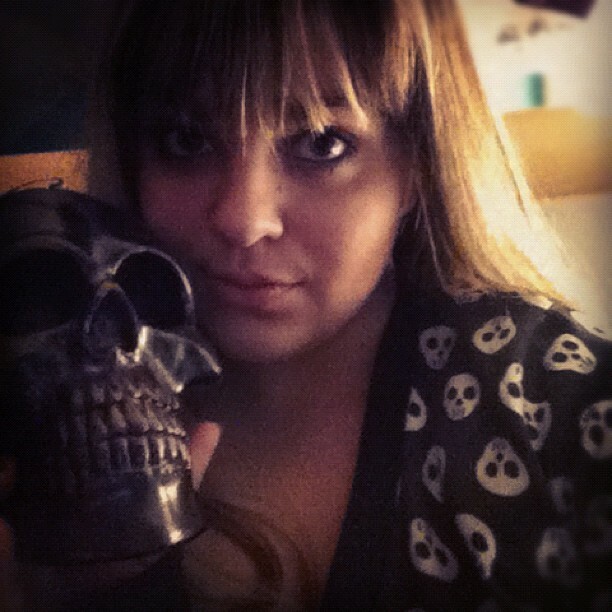 I just wanted to wish you all a happy Halloween and show you all my awesome skull cardigan and my skull candle 'friend', Skully. I know, such an original name. Unfortunately the hurricane ruined my plans of going into the city with some friends from school. Instead I spent my Halloween night playing Apples to Apples and watching Harry Potter in a friend's basement. I never get to see my old high school friends anymore now that I'm in college so I take every opportunity I can to see them. I also quickly wanted to thank everyone for re-welcoming me into the blogging world! I love the fresh start I've had with this new blog. I tried to follow back everyone who commented, if you want me to check out your blog leave a link in the comments.